BUY ONE GET ONE FREE! ORDER NOW LIMITED TIME OFFER!!! Purchase one or more and we will automatically send you 1 for every 1 you Purchase!! Dietary support may be needed to protect your against resistant strains of microorganisms. 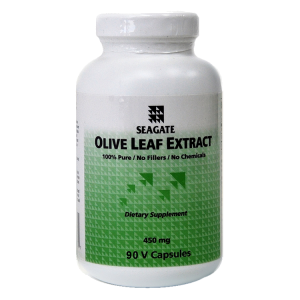 Seagate Olive Leaf Extract contains natural phytochemicals including oleuropein, to help support your good health. This product is doctor-recommended. However, Seagate (the manufacturer) is not permitted by FDA to make specific medical claims for this product regarding its ability to kill off microorganisms that cause specific disease. Therefore we recommend that you read the article by Dr. Morton Walker M.D. published in the Townsend Letter describing Seagate's Olive Leaf Extract with specific case studies. Click Here to download the PDF version of the article. Side Effects: Olive leaves have been used safely for thousands of years. The only known side-effect is the possibility of a Herxheimer reaction, an allergic response caused by the rapid die-off of germs that release toxins which may temporarily cause a brief allergic reaction, lasting for several days. Purity: There is no filler or excipient in this or any Seagate product. It is 100% pure, derived only from olive leaves. That is why the product is green. Application: Dietary support maybe needed to protect you against resistant strains of bacteria, fungi, and viruses. 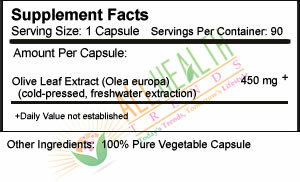 Take 2 to 4 capsules per day as a maintenance level. Take 4 to 9 capsules per day for additional support, for up to 10 days. Olive leaf can be taken with or between meals; although it is preferable to be taken one half hour before meal time. For throat irritations, you can open a capsule, dissolve the powder in 4 oz. of warm water, and gargle and swallow to help sooth your throat. The powder from this capsule can also be applied topically directly onto external skin irritations – a drop or two of water can be added to make a paste and gently rubbed into the skin. The skin will absorb the powder and its light green natural coloring. (The color will wash off with soap and water.) For irritations of the mouth or gums, pack some powder directly onto the irritated tissue and allow it to slowly dissolve. Value: One Seagate 450 mg. capsule costs about the same as the 250 mg. capsules made by many of our competitors. We are able to provide better value because we do not purchase our raw material from other dealers. Seagate harvests and performs the entire extraction process in our own plant. Seagate is now able to realize cost economies from processing 13 health food products within the same plant. Storage: Keep bottle tightly closed, in a cool dry place. Do not refrigerate.